Frank Connet is an American artist best known for using the process of the dye-resist technique of mokume shibori, hand stitched resist pattern on fabric. Connet recieved his BFA in 1983, from Kansas City Art Institute. He specialized in traditional indigo dying after a lifetime of experiments in traditional textile techniques. During this time, he explored mostly Japanese heritage, above all, sewn and clamped dye resist techniques of shibori and itajami as a starting point for his artworks. 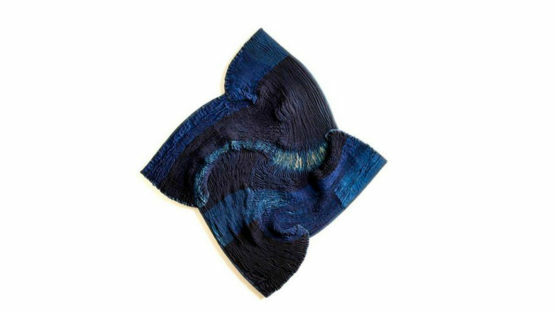 Frank Connet combines shibori with quilting techniques such as layering and piecing of fabrics to produce abstract compositions of contrasting colors. His forms echo the natural material he uses in his dyes, such as leaves, pods or seed shapes. Rivers, shifting sands or the unfurling of a leaf are all patterns used both for the large scale hangings as the sculptural three dimensional pieces. What Connet does is an attempt to simply capture a memory of one specific moment in time, such as sunset or the dance of the leaves in a small creek. Constantly changing natural world is never-ending inspiration for this artist. His work is included in numerous public and private collections like De Young Museum, The Art Institute of Chicago, City of Chicago, MacArthur Foundation, Ann Arbor, Vedder Price and many others. He is represented by Matthew Rachman Gallery. Frank Connet lives and works in Chicago.